The Masia 6 piece cheese and dip set will get your next party started the right way. 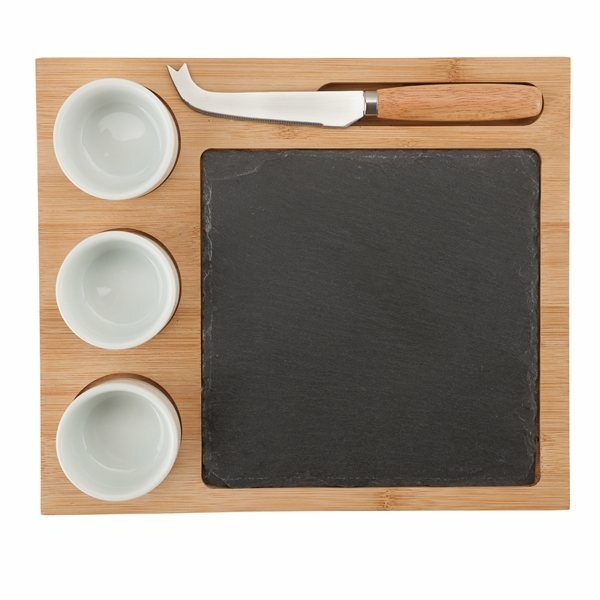 It includes 3 porcelain-finished dipping cups for sauces or small snacks, a stainless steel knife with forked tip for hard cheeses and a slate cutting surface. All 5 removable pieces are inset on a bamboo base for easy carrying and beautiful presentation. FDA compliant, made with stainless steel, bamboo and ceramic cups. Finish / Material: Bamboo, Stainless Steel, Ceramic.